On Wednesday I sent my car in for fixing small scratches in front bumper area and it's supposed to finish today according to what I was told. However the guy wrote due date June 18th in the job form. He must be misunderstanding because I said 3 days (including the day I sent the car in) and it's my false as I didn't check it when I received the form. So today I took my first ride on the subway, or MRT. I had to meet Bas, Title, and Kru Aom, my instructor pilot in my first 10 flight hours, for a lunch at Central Ladprao. 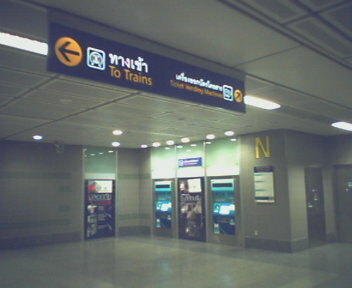 It didn't feel so much different from the BTS skytrain except the sliding doors on the platform, and the token. 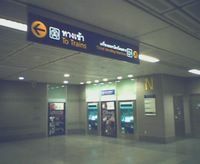 I didn't like how they announced a few stations, ie Rama 9 and QSNCC stations--they said Phra Ram Nine and Queen Sirikit Center, in my opinion, they should have been either Rama Ninth, or Phra Ram Kao, and Queen Sirikit National Convention Center, or just National Convention Center. (Fussy? That's me.) Anyway, in general I liked it more than BTS because the place looked better decorated and it's air conditioned. Kru Aom hasn't changed a bit from the last time I met him. It's been almost a year now. He left Hua Hin flying school for an airline pilot job at Air Asia, and might leave Air Asia for Aerothai soon. We had lunch at MK and had a long talk about everything. I'm glad to see him again today. Keep in touch, teacher.